JULY 9, 2013 | by Darcy Blake | “What advice would you have for someone who has just been diagnosed with Parkinson’s Disease,” I asked my 85-year old mom.The day was going to be a scorcher and our plan for me to take her outside for a spin in the wheelchair was quickly overpowered by the mid-morning heat in Southern California. 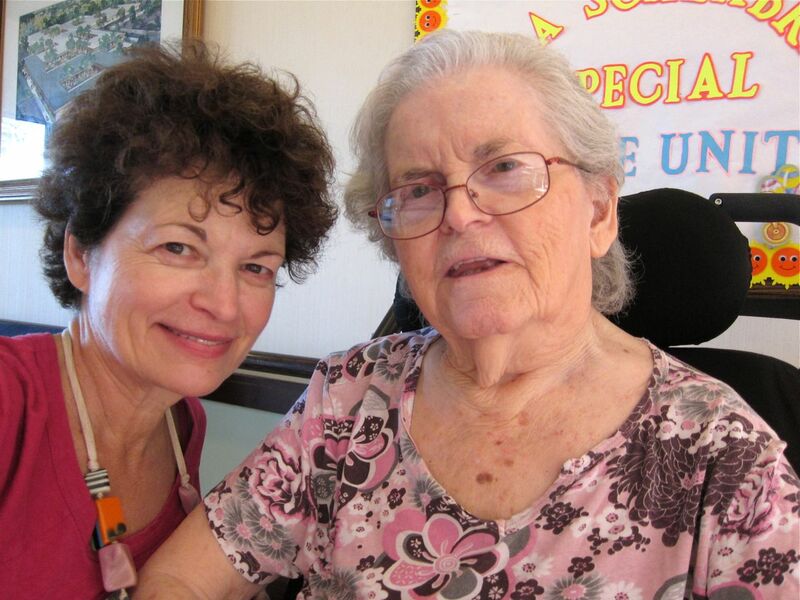 As I wheeled her through the gardens of the nursing home where she lives, I told her about the Parkinson’s Women’s blog and that this was a chance for her to share a 25-year veteran’s sage advice about coping with the disease. “Let’s go inside before I get heat stroke,” she said, shading her eyes from the bright sun. My mother has always been very articulate and creative. While raising 5 children, she earned her master’s degree and worked as a school psychologist; she created elaborate crafts projects; she organized memorable family celebrations; and worked as a volunteer window dresser at the local cancer society resale shop. Throughout my childhood and adult life, I’ve always counted on her, and expected her to have just the right answer for everything. And so, when I asked her the question about PD advice for the second and third time once we were out of the heat, I expected that she would give me a brilliant quote on the experience of progressing with the disease. This time, mom did not have an answer. It startled me. Was thinking about the disease too much for her? By then, it was her lunch time, and I sat with her as she executed a masterful job of feeding herself meatloaf, carrots and mashed potatoes slowly but successfully with just a little help from me. As I headed home after our visit, I realized upon reflection, that in her usual practical way, she had actually given me a wise lesson. Due to the wide range of Parkinson’s Disease symptoms, there is no universal advice one can give about how things will evolve. Just because one of us has a symptom or outcome doesn’t mean we will all progress in a similar fashion. What is consistent and remarkable is my mother’s never-failing ability to give me helpful insight just as she has always done, even as her PD has progressed over 25 years. Her long-term resilience and accomplishment in spite of Parkinson’s Disease is encouragement for those of us who are wondering about the road ahead.